The gravestone of Elizabeth Charlotte Smith in the churchyard of St James the Less, Hadleigh. J. Allister Smith, Colony Governor, appointed 1930. 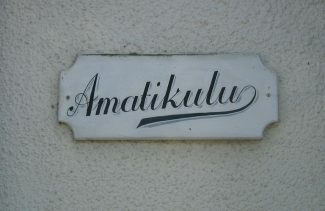 The property in Castle Road still retains the name 'Amatikulu' named after the river in South Africa where the Salvation Army settlement was established. 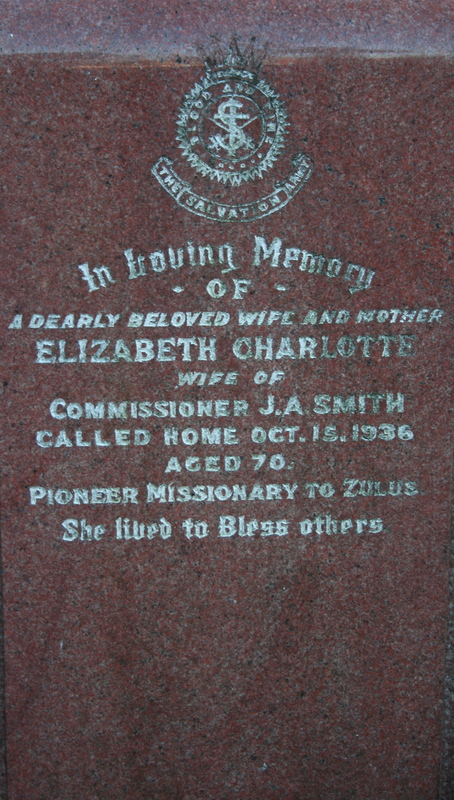 The graveyard of St James the Less Church in Hadleigh has some interesting gravestones, one in particular caught the eye of fellow archive member Val Jackson, being the grave of Elizabeth Charlotte Smith, pioneer missionary to the Zulus. She asked if I would find out more about this Salvation Army lady and why she is buried here in Hadleigh and where was her husband buried. Here is her story. Elizabeth joined the Salvation Army from Nunhead in 1890 with a desire for missionary work. The call to missionary work in those early days of uncertainty, which accompanied the new movement’s rapid expansion, found her ready to respond and following a period of training she was appointed to a Salvation Army centre in South Africa. As Captain Elizabeth Whitfield she met and married J. Allister Smith in 1892 and as a young bride soon entered upon the pioneer work which was destined to fill so large a part of her life. Her husband was one of a small party of officers who were commissioned by the Founder, General William Booth, when he visited South Africa, asking them to open up Army activities in Zululand. For the first ten years of their sojourn in that country, the young couple lived at the Catherine Booth Settlement at Amatikulu. They had six children, all born in Africa and her husband’s long absences from home, made necessary by the long distances, threw the whole care and training of the family upon her. This London-bred woman, accustomed to the lights and bustle of suburban life, bravely endured the long, silent African nights, the only white woman for many miles around. She fully shared the hardships, isolations and perils of those early days in Zululand, showing undaunted courage and meeting emergencies with a calm and practical mind. The medical work, which she undertook, helped her in winning over many Zulus to Christianity. She even won over a local tribal Chief, who had forbidden his tribe to have any contact with the Army settlement. He self-inflicted a wound, which unfortunately became very painful and poisonous, requiring medical attention, but his own witchdoctor was unable to effect a cure. Fear and pain drove him to the very place he had shunned, the Salvation Army settlement. 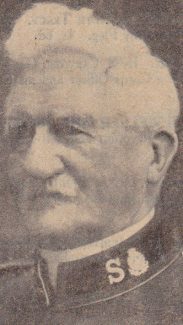 After the friendship of this powerful man had been won over, he instructed his head men, followers and their wives and children to attend the Salvation Army meetings. It was Elizabeth Smith who first taught Zulu women how to cut out clothing from paper patterns, to use needle and thread, which enabled the women to make scores of dresses, but with the stipulation that after they had made the first dress, the Zulu women must make any subsequent dresses themselves, thus encouraging self-help. For many years these patterns were treasured. When her husband was later appointed back to Headquarters in London, Elizabeth Smith also returned to England with her husband. She still had to endure spells of loneliness while he was travelling for the Salvation Army on International campaigns. They had served over thirty years as missionaries, working with native races. Prior to his retirement in 1936, her husband, J. Allister Smith was appointed governor of the Salvation Army Land and Industrial Colony in Hadleigh, a position he held for six and a half years. Elizabeth served as Home League Secretary (women’s group) at the Colony Citadel. 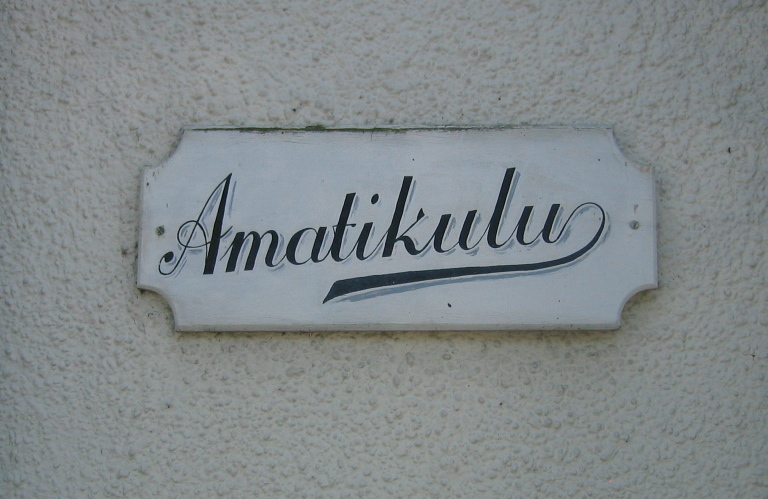 He had a bungalow built in Castle Road for their retirement, naming it ‘Amatikulu’ and the property, though not now owned by the Salvation Army, retains this name. Sadly, Elizabeth passed away in 1936 aged 70 years, although her husband lived on until the age of 92 and passed away in 1960 in Cape Town, South Africa. Of their six children, two became Salvation Army officers, sadly one son, Estill, died in Johannesburg aged 19 years. At her funeral, big crowds gathered in the Hadleigh Salvation Army Citadel and at the graveside in the churchyard of St. James the Less, Hadleigh, when Commissioner Catherine Bramwell Booth conducted the funeral of Elizabeth Charlotte Smith. She was promoted to glory, as the Salvation Army would say, on 15th October 1936, from her home in Hadleigh after a long and trying illness, in fact her gravestone says ‘Called Home’. A group of Salvation Army officers who had served in South Africa, men from the Hadleigh Farm Colony, local residents, and many Salvationists were present, forming an inspiring procession headed by the Hadleigh Colony Band. 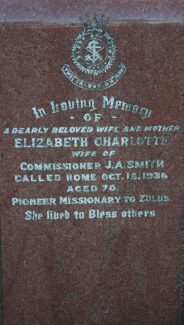 She was truly a “white friend of Zulu women*;” through the silent African nights and long lonely days of isolation, Elizabeth Charlotte Smith prayed and worked for the Salvation of the People. She will long be remembered for her brave and gallant pioneer work, along with her husband, amongst the native races of South Africa. I would like to thank and acknowledge the help of the Salvation Army International Heritage Centre in preparing this article. References: ZULU CRUSADE by J.A. Allister Smith, HURRAH FOR AN AMBULANCE by Major Joan Corner, War Cry 1936 and Salvation Army Year Book 1951. Major Joan Corner, SRN, SCM, was appointed to the Booth Memorial Hospital, Cape Town in 1953 and the Catherine Booth Hospital, Zululand in 1957 until 1961 as Matron. She now lives in retirement in Norfolk, England. What an interesting story. I well remember Commissioner Smith, he was the boss at the colony when I was a child; he used to visit the Sunday School in the old Citadel. My mother would have been a regular attender at the Home League at the time. The bungalow in Castle Lane at one time in the 1960s was owned by Bill Lines and his wife, he was a welder at Coryton Refinery. I installed the central heating for him, I wonder if it still works?